Politico reported yesterday that House Speaker John Boehner is laying the groundwork for that most elusive of all chimeras, the “grand bargain” with President Obama before he steps down. Barring that, he’ll push through a clean debt ceiling hike. Either way, this ends four years of constant hostage taking of the nation’s—and the world’s—economy for short term political gain. It didn’t have to be like this. 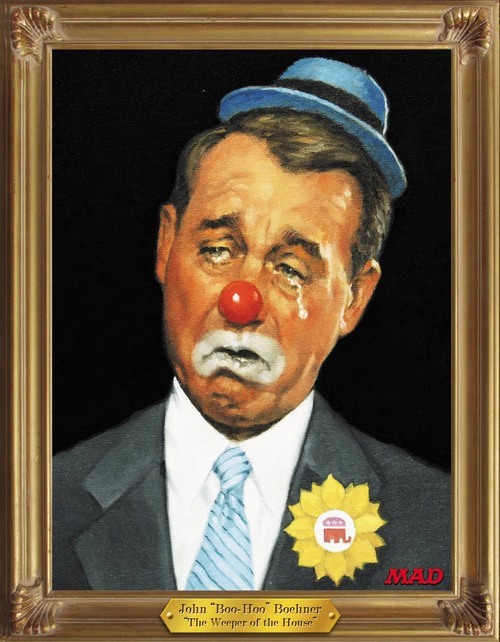 At his heart, I don’t believe Mr. Boehner is a bomb-throwing nihilist as are the members of the “Freedom Caucus”. He’s been in Congress since the 1990s, and has a concern for the institution. He could have easily followed in the time-honored tradition of seeking to build coalitions with those across the aisle and sideline the radicals in his own party. He wouldn’t have gotten everything he wanted, but he would have gotten some of it, and the country would have worked much more efficiently. The above is an actual quote by Heritage Foundation president and Teabagger extraordinaire Jim DeMint, formerly of the Senate until he found a way to make more money off the rubes principled conservatives. Yes, the slaves were eventually freed because, according to DeMint’s conflation of history, it was in the Constitution that “all men are created equal and have inalienable rights”. They were also freed due to the efforts of William Wilberforce, noted English anti-slavery campaigner, who just happened to die in 1833, thirty years before the Emancipation Proclamation and the `13th and 14th Amendments to the Constitution. Government had no role in the freeing of the slaves. It was all people power! But, wait, why did we need amendments to the Constitution if the freedom of slaves was in it from the start? Because, of course, nothing of the kind was in the Constitution. Slavery was allowed to continue, and the slaves were counted as three-fifths of a person for purposes of the census. I’m sure they were very glad to know that not only were they not full human beings under the Constitution, but that even that diminution of their humanity allowed slave states to have an outsized influence in Congress, since those slaves counted towards apportionment of House seats. The fact is that history doesn’t look too kindly on the successors to those slave holders. They are, rather correctly, excoriated. He can’t have imagined the GOP hate and madness ahead. Can he? A quick trip down memory lane. Democrats had suffered a crushing blow on no other day than the 1st Anniversary of Pres Obama’s Inauguration into office. Jan 20, 2010. We had lost Sen Ted Kennedy’s seat. The fate of the Healthcare bill hung in a balance. It had passed the House earlier in December 2009. The Senate version passed in a cliffhanger moment with ailing WV Senator Robert Bird being wheeled in, and Sen Sherrod Brown flown in by WH straight from a funeral, to cast the critical filibuster-proof vote just a breath before Christmas Day 2009 rolled in, and start of congressional winter recess. But come January 2010, the two bills needed to be reconciled. On this anniversary date, Scott Brown trounced Martha Cokeley in the MA senate special election. Democrats’ threadbare 60 filibuster-proof caucus, gone. Healthcare reform teetered on brink of collapse. Many Very Serious People in the Beltway, pundits and Democrats told the President to give or radically scale back his Healthcare quest. Chief of Staff Rahm Emanuel read him the “Political-Implications-Riot-Act.” WH was in a deep funk. Then came the Republican House’s grand invitation to Pres Obama visit their caucus retreat in Baltimore, MD. They probably wanted to humiliate the president for his recent loss, through fake chivalry. WH RSVPed with one tiny request, whose acceptance a House GOP member later said was the biggest mistake they ever made. Pres Obama had asked to bring camera crew along. There’s a reason that the 1 hr 20 minute Q&A section that followed these opening remarks shook the Beltway political universe, prompting media calls for British-style “Prime Minister’s question Time” tradition to be established here in the US, to engender real dialog among political parties. Of course GOP rejected the idea and it fizzled. But for many Democrats, what became known as The Baltimore Massacre, would be grist for partisan loremaking. One man. 183 GOP congresscritters & their families. (Sinews taut). Room darkened, spotlight on POTUS against black curtained backdrop. T’was like oratory in a theater. No notes. Brilliance extempore. The entire exchange is worth spending time listening to again in its entirety just for the sheer thrill of watching President Obama glow in the den of the opposition. However, there is a segment key to the subject of this essay; that President Obama foresaw exactly the predicament that Republicans would be in now, incapable of saying “Yes” to anything he proposes, offers or agrees with them on, that they become convulsed contortionists. Rep Marsha Blackburn (R-TN) had asked Pres Obama why he won’t take GOP (harebrained) plans on healthcare reform. He patiently tried to explain to her that Democrats HAD included many Republican ideas into the healthcare bills if they were objectively shown to be workable. But the critical point he made was that their reflexive rejection of anything he’s proposed including personal demonization of him, was going to hurt them in the long run. 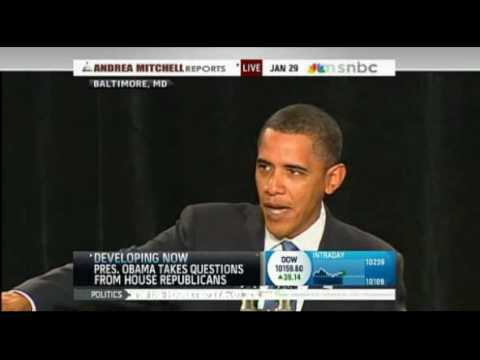 So, 45 months ago President Obama predicted exactly to a T the current GOP Convulsions. We’ve seen this phenomenon play out over and over, but none of those prior occasions have been as dire as the shutdown we’re in the midst of and the looming economic catastrophe should we enter default. Speaker Boehner, there is a way to retreat from that feeble ledge. President Obama WILL help you if you let him. And I am dying, because of the political games you are playing right now. You see, I was born with Crohn’s Disease. This didn’t happen because I ate unhealthy food, or because I smoked, or because of any of the other reasons we use to victim blame sick people and justify not giving our countrymen adequate health care. I became severely ill beginning in the third grade because I won a genetic lottery that left me with a disease that would quickly drop me to 87 pounds, render me unable to walk at times, and nearly kill me twice…..
…. I don’t tell you this to make you feel sorry for me, Mr or Mrs lawmaker. I tell you this because I am tired of being reduced to a number, a statistic or, even worse, being described as a freeloader that wants to live off of the government health care teat. I tell you this because if you defund Obamacare, or delay it even for one year, as you are debating today, then this will be my last letter to you. I will be dead before my 27th birthday. If you think that my life, and the lives of thousands of other people like me have no value, then by all means, delay the ACA. But before you do so, I’d like to invite you to hear stories from others like me, or, if you find yourself in the great state of Oklahoma, come meet me. I’d love to show you around and buy you a cup of coffee — and to introduce you to the woman you are killing. Eugene Robinson: Obamacare is here. Get used to it. Longtime journalist Carl Bernstein on Tuesday called on the press to abandon the false equivalence that’s colored much of the coverage of the government shutdown. Appearing on MSNBC’s “Morning Joe,” the man who helped break the Watergate scandal said that the current budget impasse is not a two-sided matter. The Nevada Democrat explained in an interview with Esquire magazine why he recently said the Tea Party caucus is losing their minds. Now that Obamacare’s new insurance marketplaces are open to the public, some uninsured Americans are eager to sign up. However, many others likely remain confused about their options under health reform, particularly as Obamacare continues to get caught in the political crossfire. In order to bridge the education gap about the health law, advocates are ramping up their enrollment efforts in creative ways. For instance, you can now text ENROLL to Planned Parenthood to receive information about health reform. Waste billions of taxpayer dollars? Check…. Interfere with key government operations? Check…. Derail the hated Obamacare? Ch . . . — oh, no, wait a minute….. I was looking through my personal library this past weekend, lost in my thoughts as to how we’ve come to this present pass in American politics, and came across a book I haven’t read in 20 years, but have clung to. The Party of Fear: The American Far Right from Nativism to the Militia Movement by David H. Bennett, was published in 1988 and revised in 1995. It makes for grim reading. It’s a sad truism of the United States that we as a people are ahistorical. We have no memory of what happened last week, much less in the last century. If we were to remember our history, we might be better prepared for when it invariably rears its head again, the passions and bigotries of the past roaring out of the dark id of the American psyche. We fight the same battles over, because the causes of those battles are never fully addressed. With just days to go until the nation hits the debt ceiling on October 17th, a growing chorus of Republican lawmakers have begun dismissing the dangers of national default, insisting that the government can continue paying interest on its debt and fund the most critical programs. Economists have dismissed this prioritization scheme as chaotic and unworkable, warning that the United States would be “unable to pay between 40 to 45 percent of the 80 million payments it makes every month.” If the debt ceiling is not increased, the credit markets would freeze, the value of the dollar would plummet, interest rates would skyrocket, and a global recession would ensue. But the so-called debt ceiling truthers, who swept into power after the 2010 midterm elections and, to the surprise of GOP leaders, took over the debt ceiling debate, continue to deny this reality. Below is a brief timeline showing how they rose to power and prominence within the Republican party…..
Charles Pierce: Where Are The Gutsy Republicans? You’ll forgive me if, at the moment, I decline to believe that we will be saved from the Reign Of The Morons by unicorns, the Easter Bunny, or reasonable Republicans in either house of Congress who would gladly vote with the Democrats, if only evil castrato Speaker John Boehner would allow them to do it. You will also forgive me if, at the moment, I decline to believe in mermaids, the Pooka McPhillimey, or fed-up plutocrats who can find a sucker to primary Tea Party congresscritters from what passes for The Left in the Republican party these days. … The Reign Of The Morons is many things, but one of its most obvious causes is a complete failure of political courage within the Republican party. It isn’t simply a matter of the party’s having created a monster that it can no longer control – although that’s undeniable part of it – it also is the fact that the party lacks a substantial center of power that even is willing to risk trying. Say what you will about Victor Frankenstein. He chased his creation to the ends of the earth. Where are the Republicans who are willing to ride the ice floe? Boehner: We’ll crash the economy if the president doesn’t negotiate and by negotiate we mean give us what we want with nothing in return. As the deadline neared for the nation’s first-ever war-time government shutdown, the consensus was that congressional Republicans, already unpopular, would feel the brunt of the public backlash. So far, those expectations were correct. A Washington Post/ABC News poll released yesterday found widespread dissatisfaction across the board, but Americans’ attitudes towards Republicans are especially brutal. While approval for President Obama and congressional Democrats ticked higher in the wake of the government shutdown, approval for congressional Republicans dropped to a woeful 24%. Just as important, GOP lawmakers, who shut down the government exactly one week ago, have seen their disapproval ratings soar to 70%. A majority of Americans, 51%, now say they “strongly” disapprove of the nation’s far-right party. The Republican Party’s geyser-like misinformation campaign regarding the government shutdown, accompanied by continued misinformation about the Affordable Care Act and the debt ceiling, has been almost too powerful to follow as it whizzes by. The latest line, which appears to have convinced a majority of Republican voters, is that nothing will happen if the debt limit isn’t raised, least of all a default. As I pointed out yesterday, this is complete nonsense. We’ve heard this before in the form of denying the climate crisis in the face of almost unanimous scientific consensus. In this case, dozens of experts are forecasting the worst possible consequences if the House GOP doesn’t perform what was formerly a very customary task, devoid of melodrama or hostage-taking.